My newsletter includes content in the following genres: science fiction, fantasy, paranormal, and horror. I will occasionally include “how-to” books (e.g., writing, publishing, marketing) for authors. I will also occasionally include science books if I feel they have a real potential of providing fodder for science fiction authors as well as mythology and medieval history if they could provide input to fantasy authors. I hold a giveaway each month. I typically contribute reviews of books I’ve read, book excerpts, character interviews, and current status of my writing. I am very much interested in hosting author and character interviews, book spotlights, and guest blog posts. If you want me to post a book spotlight or a character interview, I would appreciate an e-copy of your book so that I can read and review it on the blog. I also post my reviews on Amazon and Goodreads. 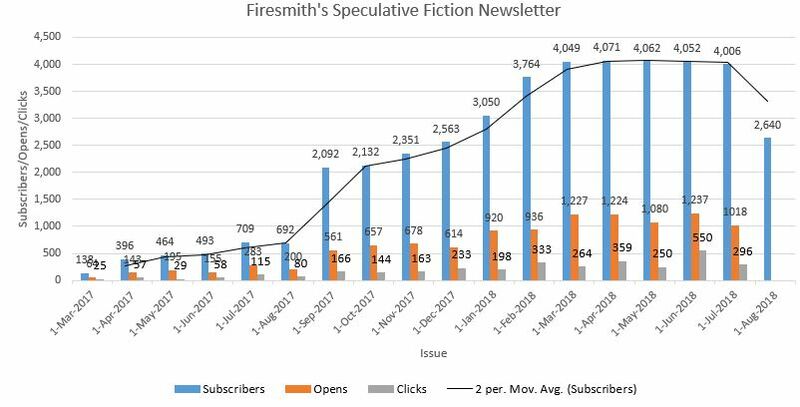 The following graphic shows how the readership of the newsletter has increased over time. Each month, new people subscribe while others unsubscribe. Readership began to greatly increase in September 2017, when I started offering free ebooks in exchange for subscribing as part of Instafreebie group giveaways. Subscriptions plateaued in March 2018, when I made subscription optional (i.e., requiring explicit opt-in). Subscriptions will drop with the August 2018 issue due to scrubbing my subscriber list of people who consistently do not open the newsletter email. News, Sweepstakes, TBD group giveaways of FREE ebooks, Author TBD’s TBD and Author TBD’s TBD (Spotlight). News, Sweepstakes, FIVE group giveaways of FREE ebooks, Author Carissa Andrews’ Oracle and Pendomus (Spotlights), and Author Adrienne Woods’ Dream Casters Light (Spotlight). News, Sweepstakes, FIVE group giveaways of FREE ebooks, and Michelle Lowe’s Legacy (Spotlight and Character Interview). Movie Script Status, TJ Muir’s On Borrowed Luck (Spotlight), Jean Nixon’s Jax Starlight (Spotlight), and Nick S. Thomas’s Battle Beyond Reality (Spotlight). Movie Script Status, John Ackers’s The Infinet (Spotlight), L. D. Fox’s Corrupting Xenia Applebottom (Spotlight and Book Review), and Carlyle Labuschagne’s The Shadow Files (Spotlight). Movie Script Status, C.E. Clayton’s The Monster of Selkirk (Spotlight and Character Interview), Marilyn Peake’s The Other (Spotlight), and Renee Scattergoods’s The Dream Crypt (Spotlight). Book Launch article and Andy Zack’s Zombie Turkeys Book blast. Fill out the following form to subscribe to my monthly newsletter. You’ll find book reviews, author and character interviews, spotlights on paranormal, fantasy, and science fiction books, the latest news about my books, contests, and giveaways.